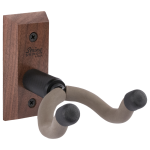 String Swing's "Guitar Keeper" Wall Mounted Guitar Hanger has a deep cradle design that prevents the guitar from being improperly placed in its hanger - in turn - promoting safer handling of your instrument. Made of authentic North American hardwood and produced in the USA. Available in four varieties of hardwood.